The Alila Ubud Spa is committed to providing unique treatments delivered from the heart; treatments that subtly blend ancient Asian healing techniques with age-old beauty recipes and locally inspired treatments and featuring the curative benefits of fresh, natural, quality ingredients. Balancing expertise with an intuitive sense of wellbeing the therapists are all trained in anatomical physiology, massage, meditation and service, combining the latest organic nutrition and health knowledge with the most essential element – tender loving care to stimulate, rejuvenate, balance and relax your mind and body. There is an extensive selection of treatments to choose from including rejuvenation and therapeutic massage, pregnancy and children’s massage, warm stone and Shirodhara therapies, reflexology, him and her facials, body treatments, scrubs and wraps, hands, feet and nail care and hair treatments. The rainforest retreat package is a half-day programme designed as a fully comprehensive therapy. We start off with a 3-course lunch at 11 am followed by a relaxing break. The therapy begins in earnest with a 60-minute reflexology session of neck, shoulders, hands and feet. A soothing afternoon tea follows to relax before a final 90-minute session of therapeutic massage. 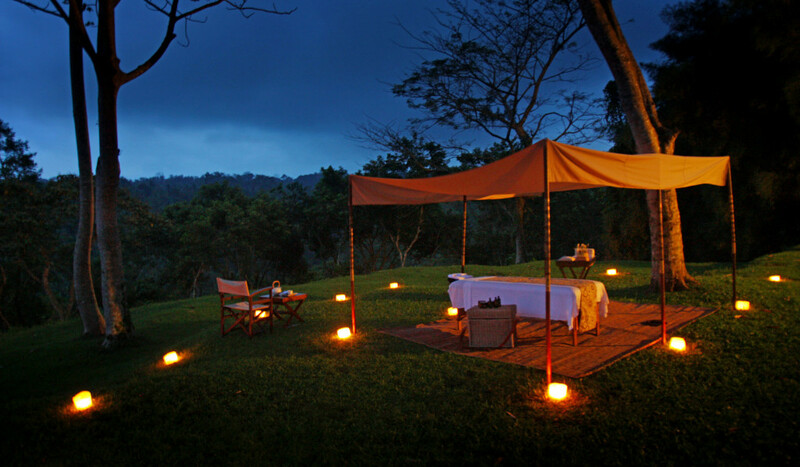 This dreamy treatment is delivered to the sounds of birds chirping and water trickling on a ‘bale’ terrace perched above a cliff offering splendid views of the tropical forests of the lush green valley of the majestic Ayung River below.